Home Outdoor play all year round! Outdoor play all year round! Toggle navigation Outdoor play all year round! 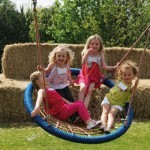 We have three categories of outdoor play equipment for you to choose from. Garden Play: For domestic customers who are keen to get the children outside into the garden and in the fresh air as much as possible. Our range includes all the family favourites including swing sets, climbing frames, and even goal posts and tumble bars. Educational Play: This selections of play equipment is for schools and nurseries and all learning institutions. We have some fabulous products to entice the young ones outside and keep them active including great trim trail items and lovely outdoor musical and sensory play sets. 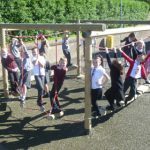 Commercial Play: For all sectors that will have the public using the play equipment including Local Authorities, Architects and Housing Developers, Community Groups, Tourist Destinations, Towns, Parishes and Community Councils and the Leisure Industry. So why not have a look at our large selection of fun and exciting pieces of play equipment and get in touch if you need any help in deciding which is the best selection of products to suit your needs. Would you like a chat about your outdoor play provision? 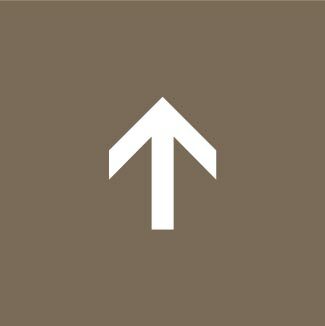 – call the office on 01577 840570 alternatively please send us an email to info@caledoniaplay.com. 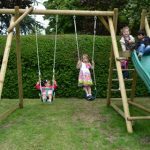 *Our products have been designed for all ages of children to use however we are happy and confident that our Swing Frames, with their 12cm diameter top poles and high quality fully through swing points, can carry a combined weight of 200kgs, so usable by the whole family. We believe that a good quality timber play set is an investment and should be enjoyed and used by children as they grow into teens and adulthood. For the individual swing seats, maximum weights are advised by the manufactures and vary according to seat type. With the exception of the Basket Swing the maximum advised weight for our Garden Range Swing Seats is 70kgs (roughly 11 stones).